Peace has descended and Toraja is luring tourists back with agro-tourism and cultural experiences. Toraja in South Sulawesi is striving to put itself back on the international tourist map after lying dormant for some 15 years. Death is celebrated with much excitement and festivities for the Torajans, who practise elaborate funeral rites and carve burial sites into rocky cliffs. This unique culture and tradition had been a major draw for Western tourists who dominated arrivals to Indonesia in the 1990s. However, following the race riots in Indonesia and the Poso riots in Central Sulawesi in the late 1990s and early 2000s, the European market dipped and Toraja was scrapped off from tour operators’ itineraries, wiping the destination off the tourism map. Toraja also subsequently failed to attract the rising domestic and regional markets, partly because of the sensitivity of some markets towards death-related attractions. 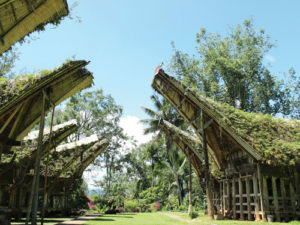 In 2012, the Ministry of Tourism and Creative Economy established the Toraja DMO, a destination revitalisation programme, with the assistance of Swisscontact. Toraja DMO is now leading the developments taking place in Tana Toraja Regency, the southern part of Toraja. Luther Barrung, chairman of Toraja DMO, said: “The southern part of Toraja, which has large plateaus surrounded by mountains, has great potential to develop agro-tourism. “Pango-Pango, for example, is developed for agro-tourism around tamarillos, passion fruits and vegetables while Sarambu Assing is known for its waterfalls and coffee plantations. Toraja arabica coffee is internationally known and we want to develop an attraction around there,” he added. In the North Toraja Regency, where most attractions are located, upgrading of the infrastructure and facilities such as food and drink stalls, and public toilets will be rolled out over the next five years. Juliharto said Swisscontact was assisting the destination in creating a campaign that will change its image, highlighting not only “the other side of Toraja” like Tongkonan – a Torajan traditional house – but also the philosophy behind it. “Today, there needs to be more interaction between travellers and the local people. (By) experiencing their daily lives, (visitors can better) understand the culture,” Juliharto said. Barrung agreed: “We are developing homestays, so that travellers can stay and experience the local culture and way of life, while the local people will benefit directly. “Torajans produce palm wine called ballo. The Ministry of Tourism has started providing technical assistance for the locals to produce ballo in a more hygienic way. Visitors will be able to visit the plantation, learn about the winemaking process and enjoy the drink,” he added. Meanwhile, Yohan Tangke Salu, chairman of Indonesia Hotel and Restaurant Association North Toraja Chapter, is encouraging hotels to relaunch in Toraja. “A lot of people have left tourism business since the industry declined…With the entry of fibre optic to Toraja, we are training hoteliers about Internet usage and channeling them to OTAs. We have started to see some results,” he said. A new airport with a 2.4km runway is being built in Buntu Kunyi. Slated to open in 2017, the airport will help to improve accessibility to Toraja, as the nearest airport in Makassar is an eight-hour drive away. Tourism stakeholders are also talking to Garuda Indonesia and Citilink to launch services from Makassar to Lagaligo Airport in Bua, Palopo, which is about a two-hour drive away to Toraja. This article was first published in TTG Asia, September 18, 2015 issue, on page 27. To read more, please view our digital edition or click here to subscribe.